The achievement of the proposed objectives can only be fulfilled through a well-coordinated effort. This undertaking involves tasks ranging from deposition and characterization of nanostructured materials to electromagnetic modeling of RF-MEMS, advanced WBG semiconductor technologies to antenna fabrication and component development to system integration. The work plan methodology is based on a top-down philosophy that employs efficiently both the broad expertise of the partners as well as their long-standing collaborative links. 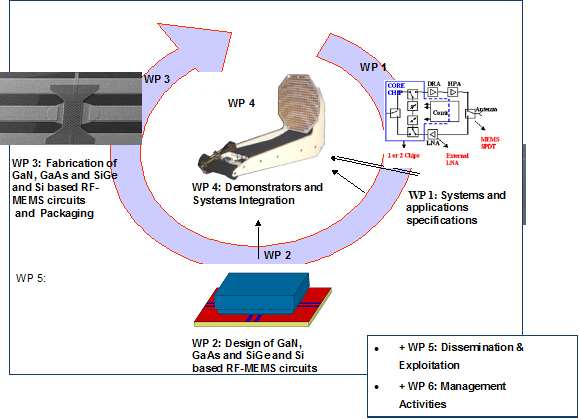 The goal is to devise novel technological "vehicles" in order to develop a new type of IMS based on WBG for harsh environment operation and high power handling applications. - Study and development of the technological process in order to reduce the size of the MEMS Switches. This activity will focus on the development of the technological process with the same material (PZT) than the standard one . Integration of the new nanostructured dielectrics with MiniMEMS technology. - Design, fabrication and testing of MEMS based switch capacitors and phase shifters on GaN, GaN, GaAs and Si/SiGe. - Integration of GaAs, GaN MMIC with RF-MEMS technology . - Fabrication of three demonstrators : demonstrators 1: the high power robust and reconfigurable antenna subsystems for 10-24GHz based on GaN RF-MEMS chips, demonstrators 2: the reconfigurable antenna reflect-array and low-noise blocks based on the GaAs RF-MEMS at 94GHz, demonstrators 3: the MIMO radar modules based on RF-MEMS SiGe BiCMOS chipset. - Development of measurement tools and lateral resolution enhancement techniques for the electro-thermo-mechanical characterization of small size RF MEMS.